Phessenian has head-initial VPs and AdvPs, and head-final NP, PP and CPs. There are six primary noun and pronou cases in Phessenian: absolutive, ergative, dative, genitive, locative, ablative. There are no adjective agreements. As an ergative-absolutive language, it can express passive voice with a simple change of word sequence. I am reading a book. Se lacokac tacen. The book is being read by me. Tacen se lacokac. 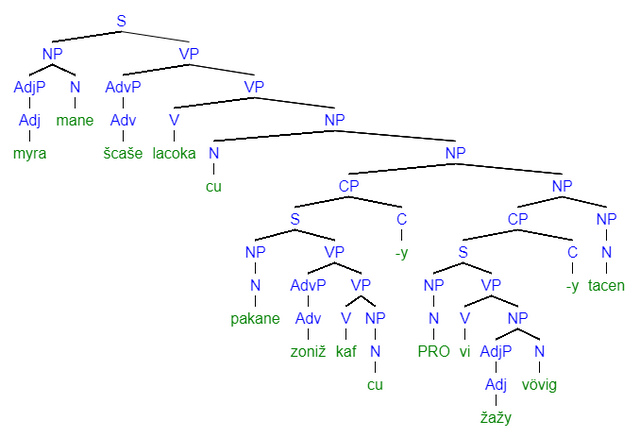 In literature and especially poetry, a SOV nominative-accusative structure may be used, in contrast to the regular SVO structure. I am reading a book. Sin tacenofa lacokac. Phessenian has no marks for tense, mood, or voice, but it does have a rather complicated aspect system for verbs. There are eight aspects, progressive, perfective, stative, experiential, continuative, inchoative, iterative, momentane. Each is marked with an suffix following a verb. I am (in the progress of) reading a book. Se lacokac tacen. I am (in the state of) reading a book. Se lacoker tacen. I am (repeatedly) reading a book. Se lacokena tacen. Verbalization is very common phenomenon in Phessenian to convert nouns, adjectives or even phrases into a verb. I "think-problem" it. (I think it is a problem.) Se vyžtigij žin. Love "made-sad" my life. (Love made my life sad.) Ege vyžagujil šof šec. Some sound samples of Phessenian. Maximum of 6 shown. Click the links to see the full texts. Kukie legü carfi šcecof co cafašec, giža te jycfyš flofac ma&apos;i. Cookies may contain nuts or peanuts, even if not included in the ingredient list. Your browser does not support HTML5 audio. Šcace frucer vyztig ylae žygžae jaškuf. Caf none tü ma gag gažmon. One of the key problems today is that politics is such a disgrace. Good people don’t go into governm... Your browser does not support HTML5 audio. Tac in šakacofa tü zoil tor, nonyne cü ma cötiš am ema gyrvyž gož tü mai zoil. When you do things right, people won&apos;t be sure that you have done anything at all. Your browser does not support HTML5 audio. How much milk do you have? Your browser does not support HTML5 audio. I came to America because I heard the streets were paved with gold. When I arrived I learned three t... Your browser does not support HTML5 audio. Žy šaface galaž žvöv, gavaž nižgaži, caföš noncün, zigrozagog važyž, lö žöv šec lö caf. The idea is like grass. It craves light, likes crowds, thrives on crossbreeding, grows better for be... Your browser does not support HTML5 audio. Below is the orthography for Phessenian. This includes all graphemes as defined in the language's phonology settings - excluding the non-distinct graphemes/polygraphs.